The 1260 day periods of Daniel 12:7, Daniel 7:25 and Revelation 11:2-3 will repeat in the future. That 1260 day repetition is the basis of the final warning period ministry of the “two witnesses” second ministry that announces the Messianic Kingdom completion portion of God’s Kingdom overall developments since 1914. That “three and a half days” “death” state after the 1260 days has expired in “when they have finished their witnessing” period, allows an extension into the period after the 1260 day period expire into Daniel 12:11 1290 day period. Thus the extension is also past Daniel 7:25’s 1260 day parallel into Daniel 7:26. And thus we can register the events of Revelation 11:8-12 into Daniel 12:11 timed period by this extension. We can also know the “constant feature has been removed” marking part of Daniel 12:11, is this final “two witnesses” cessation event to mark the start of that final “three and a half days” symbolic period that must expire into Christ’s arrival of Revelation 11:11-12. The temple judgment coming up as timed at Daniel 8:13-14 is what will eventually lead to that final 1260 day recovered witnessing period. Bethel’s apostasy must be removed to allow the final explanation of prophecy. Therefore the developments to come upon Bethel as a visible claimant center of the anointed Christian ministry will be the signal it is actually the temple judgment eventual “trampling” of Daniel 8:13-14 that will be manifesting to mark the prophecy. 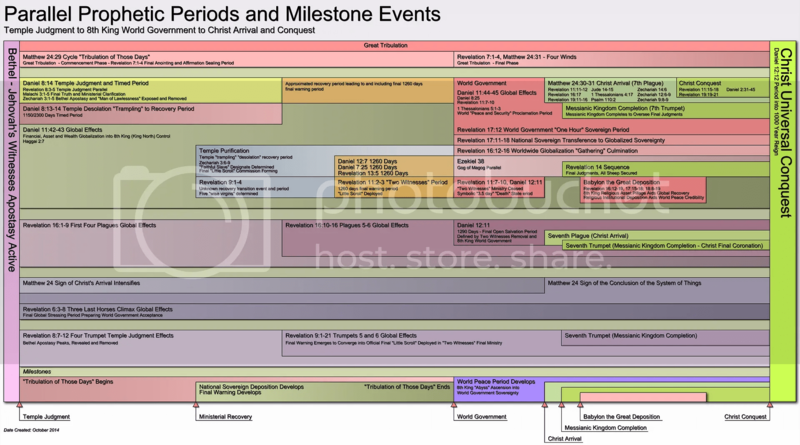 This is why Bethel promotes a deceptive delusion that it is the “end of the world” in the coming “tribulation of those days” that must actually manifest, but not to the outcome (Matt24:29) Bethel is now lyingly promoting to use those global tribulation events to cover over the required temple desolation events as long as possible. This is why Bethel will not explain why the “tribulation of those days” ends (Matt24:29) before Christ arrives. 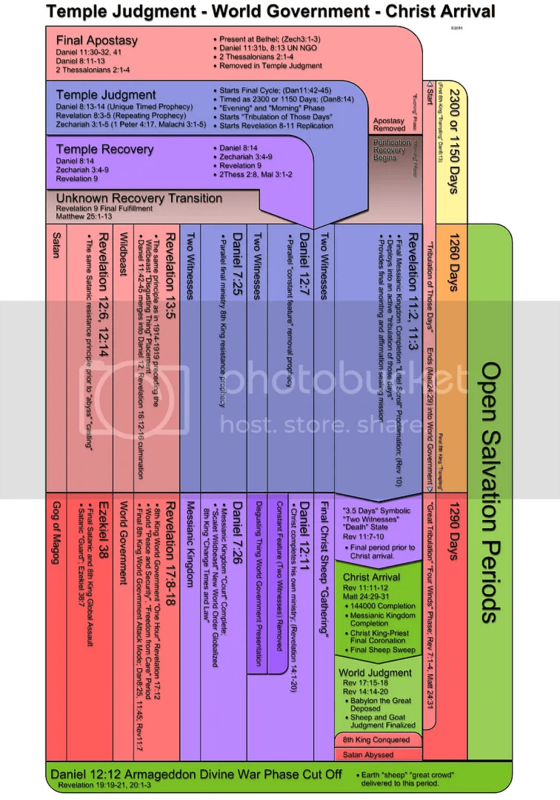 They are attempting to sell the “tribulation of those days” and the “great tribulation” and the “sudden destruction” of 1 Thessalonians 5:1-3 as all the same terminal “end of the world” progression. 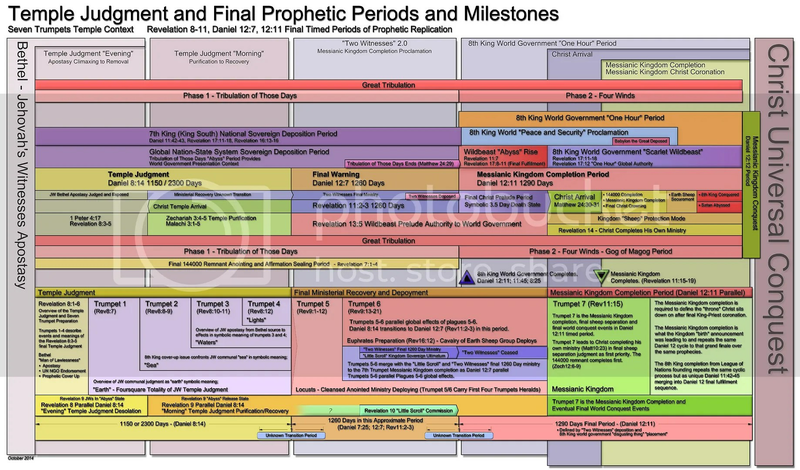 In fact all those events are different phases of the final cycle of 8th King development that will actually be manifesting as Daniel 11:42-45 as the global context of the future which final cycle is what is coming next. interesting thema and the Bible understanding. I will email you the latest articles personally, because they have the graphics to aid understanding as this is a prophecy that is a continual outline to Christ’s arrival, as first to be marked by the Bethel foretold judgment. That judgment will verify Daniel 8:13-14, and takes a couple to three years to run the “trampling” phase of the temple judgment. This respects all former JW truth, it just gets rid of the 1976 GB centered diversions from that time. 1976 is when Bethel started to go fully apostate, the JW revelation of the first two UN presentations of 1919 and 1945 are valid prophecy. 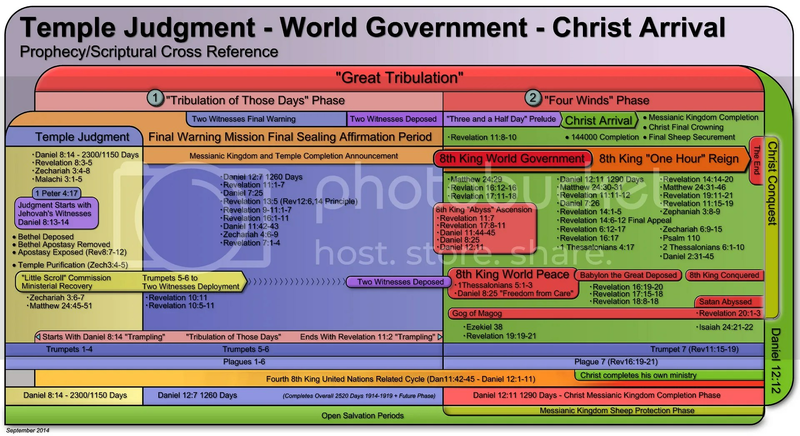 World government COMPLETION, which takes more time, is what will trigger Christ’s arrival. And this is why Bethel COVERS UP that 1990 3rd UN presentation as a continuation of the first two UN presentations in a four step trek to 8th King world government completion and thus Christ’s arrival enabled. Thus what is coming on Bethel, will clear the way to reconnect ALL FOUR UN presentations, 1-2-3-4, the fourth one is the final one of the future, to be full world government. Do not get fooled by the serious global events to form at the beginning of this cycle, which will include Bethel’s planned downfall. They use that to confuse the world, and to make JW think, too soon, it is “the end”. It will not be the end. They will resolve these “problem” developments to amplify the “solution”, as that FINAL WORLD GOVERNMENT PRESENTATION, as actual world government—a number of YEARS into the cycle. THAT is when the real end will come. (1Thess5:1-3), AFTER world government “8th King” is TOTALLY COMPLETE. Make and save copies of this information, in time they will try to remove it, when this all really hits. Check your spam folder, if you see no files, I am “bibleresearch” name. I sent you some that each have the whole outline, as stand alone explanations if need be. But each one does cover different details or possibilities for the Bethel coup phase.